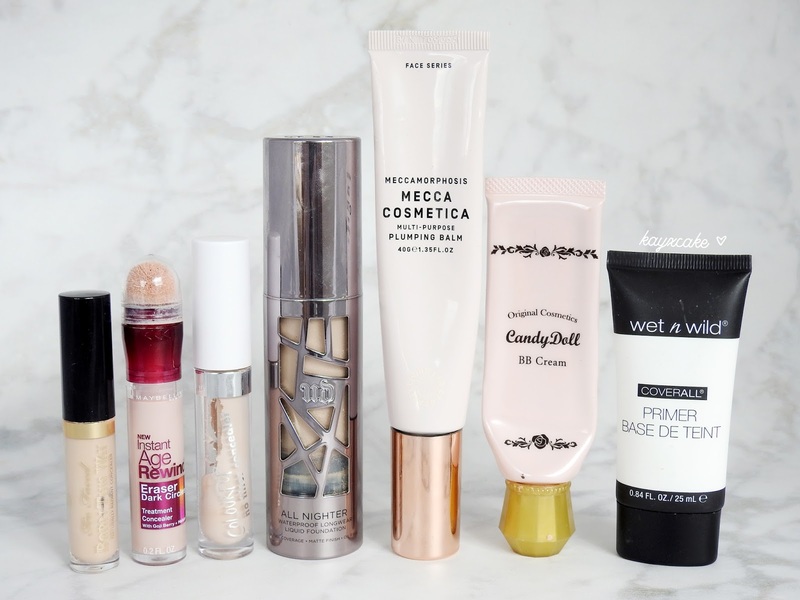 Monthly Favourites was a thing back in when I first started my blog and I have tired to follow the trend and failed most of the time because the products I use is pretty much the same every month. Although I do try out new products from time to time, it's only for a short period and then I am back with the products that I am most familiar with. I thought maybe I should change things up a little bit and write my favourites and most used beauty products seasonally. 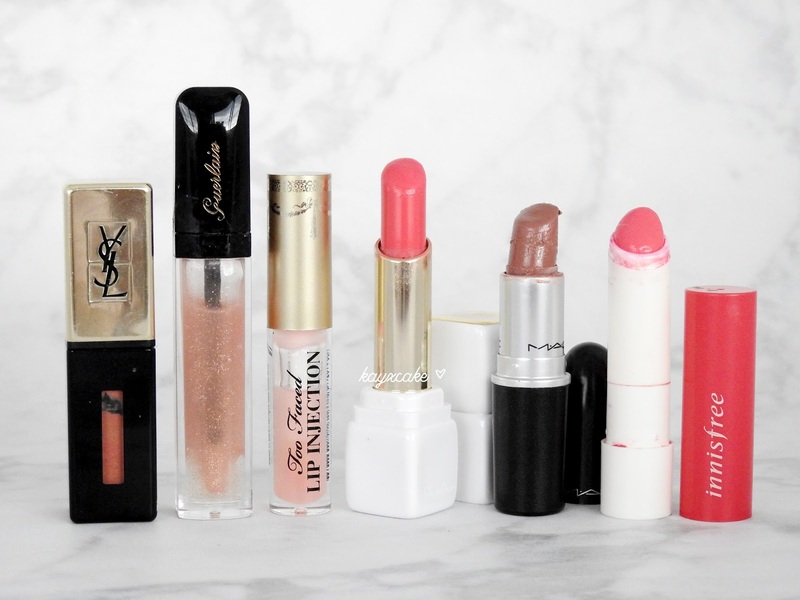 Obviously, you won't see me in a bright coral lipstick in winter, so, maybe the idea of a seasonally favourites would make things interesting. Starting today, March 2018, I am sharing with you my first summer favourites and most used product. Remember this haul where I shared with you my purchase of the MAC Prep + Prime Fix + in Lavender, Rose and Coconut? Well, I have been using the Lavender scent as a facial mist and I like that it's refreshing and moisturising, I also like the Sized to Go, as it's handy to carry around. I have read an article where someone has mentioned that all Micellar Water are pretty much the same as they have the same ingredients, just different branding and different packaging. It may be true, but this claim doesn't make me stop buying Micellar Water from different brands, as you know, most of the time I buy beauty products based on its' packaging. I have been using the Etude House Monster Micellar Cleansing Water and I am absolutely in love with the coconut scent. I use about 7 or 8 makeup pads to remove a full face of makeup with this product and I always love the result, my face feels and looks very clean, it doesn't stint my eyes and it doesn't leave my face with that super squeaky clean feeling. UD's All Nighter setting spray used to be my all time favourite, I take it every where with me and I buy several backups just incase I run out, but lately I have been using the Urban Decay De-Slick setting spray and I think this may be my new favourite. I find that it does a better job at keeping my makeup in place for longer hours. 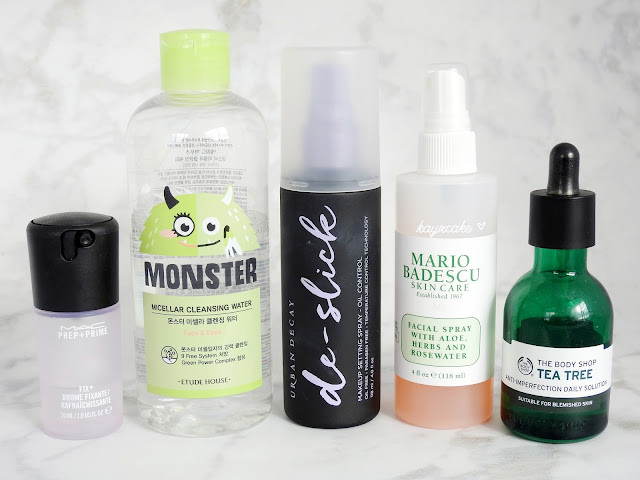 Mario Badescu Rosewater Facial Spray and the MAC Prep + Prime Lavender Fix + mentioned above pretty much does the same job, except that I bring the MAC Fix + with me everywhere I go and Mario Badescu is like a stay-at-home product. If I remember it correctly, this is my third bottle of The Body Shop Tea Tree Anti-Imperfection Daily Solution, ever since I bought my first bottle in Germany back in 2016, I have been so obsessed with this product and it has definitely made it into my holy grail list. I use this product as the first step of my makeup routine and I like that my face is a lot smoother nowadays, pimples don't randomly pop up unless it's that time of the month and it keeps my makeup stays in place throughout the day. My most used concealers this summer is the Too Faced Born This Way Concealer, Maybelline Instant Age Rewind Eraser and the ColourPop No Filter Concealer. My favourite out of all three is definitely the TF Born This Way, I love that it's buildable, but it doesn't feel heavy, it has a great coverage and it doesn't crease during wear, also it smells like coconut and that is a big win win for me. ColourPop No Filter is also great and affordable, it has a thick and creamy texture that applies smoothly, but I dislike that it dries so fast and it doesn't give you time to blend out, so the only way to have a perfect application is to apply an area one by one, instead of covering your whole face in concealer then blend out. Maybelline Age Rewind Eraser is just an okay product to me and it's one of those that I don't really understand the hype. The thing that annoys me the most is having to twist the tube for a long time for the concealer to come out and it's probably my fault for choosing the wrong shade, I have the 'brightener' and it makes my undereye looks ghostly. Urban Decay All Night Liquid Foundation is literally the best foundation for those with oily skin that loves a full coverage look. I have worn this foundation for more than 12 hours, apart from my nose area where my glasses often slides down and removes whatever makeup I have on the day, other parts of my face stays flawless. 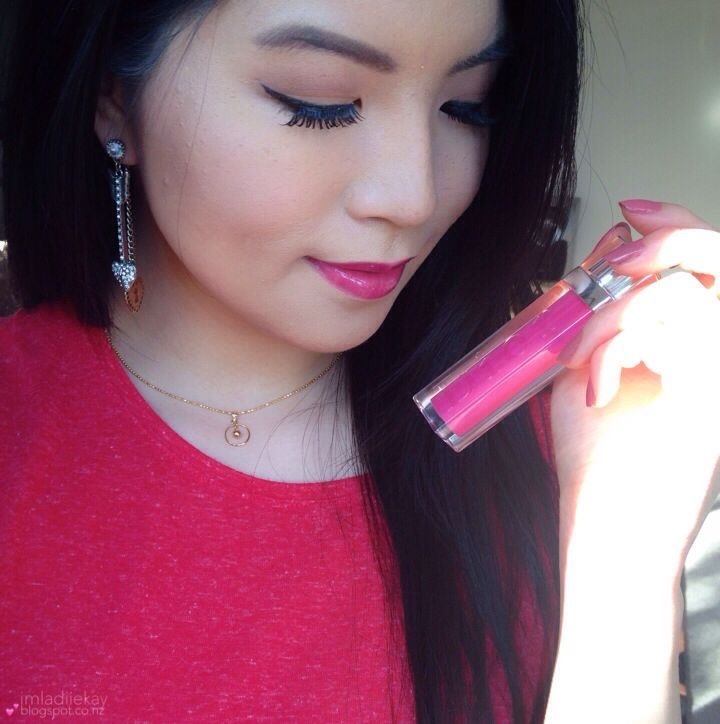 Although the formula is thick and creamy, it doesn't feel heavy during wear. I am in the shade #2.5 and I have also tried #3.5 which is a bit too dark on me (click here to see swatches). 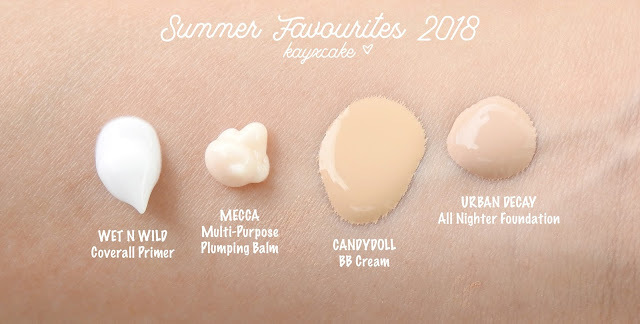 CandyDoll BB Cream has been mentioned in my Best of 2014 Foundations & Concealers and 2015 Beauty Favourites. I have tried a lot of new products during 2016 and 2017 and I don't remember reaching for this BB Cream, but I have fallen in love with it again this summer. It has a liquidy texture that feels lightweight with a good coverage, it gives you that naturally dewy look and it wears for a good amount of time. My most used primer this summer is the Mecca Multi-Purpose Plumping Balm and the Wet n Wild Coverall Primer. They are both great at keeping my makeup in face throughout the day and I love both equally. Mecca has a thicker texture while Wet n Wild is more runny, on days that I wear absolutely no makeup, just primers, I would go for Wet n Wild as it makes my face feels like a baby bum, it feels so smooth and mattifying at the same time. I bought the Guerlain Meteorites Pearls in 2014, it has been mentioned in my 2015 and my 2016 Beauty Favourites, it's definitely one of my all time favourite beauty products and as you can see in the photo above, it's been more than three years since the purchase and there is still a lot of product left. I have the shade in 'Clair' and I use it as an overall powder. I love that it's not cakey and it gives my face my absolute flawless look. As you know I am a makeup collector and I rarely hit pan on products, especially not bronzers nor highlighters, but surprise surprise, I have hit pan on the highlighter of the Charlotte Tilbury Film Star Bronze and Glow and the Too Cool For School Art Class Bronzer. CT Film Star Bronze and Glow is another holy grail that I have talked about so much on my blog and used in almost every single makeup looks posted on here and the TCFS Bronzer is actually a newly purchased product that I was testing and preparing to review, but I can't believe that I hit pan this fast. 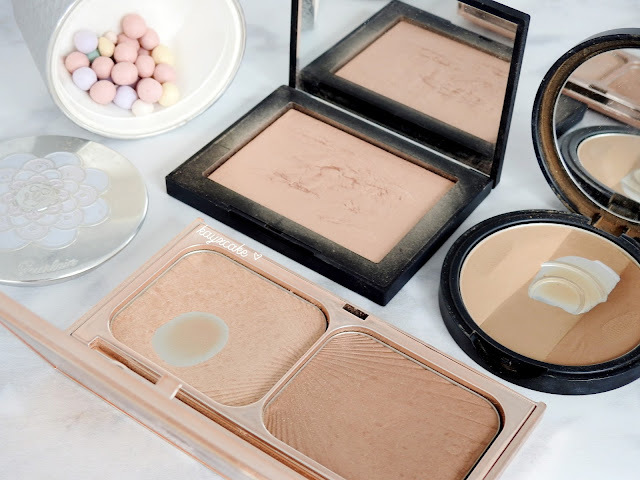 TCFS Bronzer is literally life for those with a light skin-tone, it gives you just enough shading and you can never go over the top with this product. NARS Double Take Overexposed Glow Highlighter was purchased in November last year and it has already become my most reached for highlighter this summer. This highlighter has lips shaped embossed on the actual product when it's brand new, which you can see it here, but as you can see I have obviously used it a lot and it just looks ugly now. I love that the highlighter gives a soft glow that looks natural and it's wearable on any occasion. 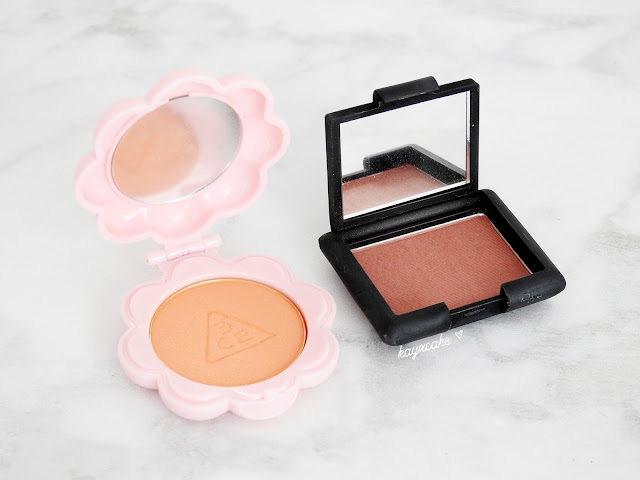 I have been switching between the 3 Concept Eyes Love 3CE Cheek Maker #Orangish and NARS Dolce Vita this summer and my most reached for is definitely NARS. This is a mini sized from the Dolce Vita + Audrey Love Triangle Set. The colour seems more suitable for the winter season when looking from the pan, but when applied with a brush, it transform into a sheer rosy shade. Can you believe it?! Two years ago I don't fuss over my brows and a year ago I only wear eyeshadows in makeup looks and now it's full on eyebrows and eyeshadows on a daily basis. 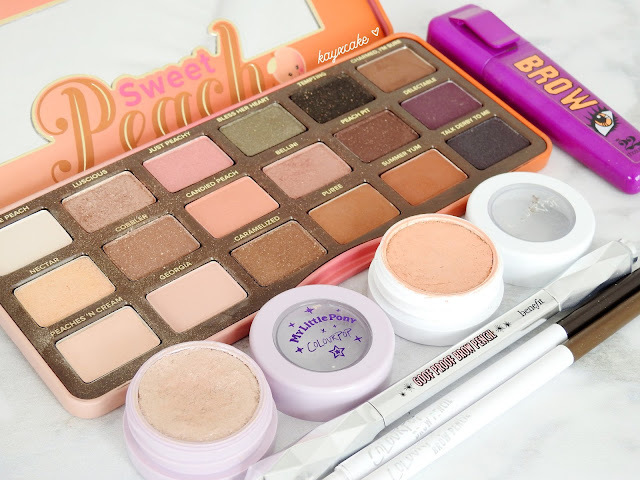 I started wearing eyeshadows to work towards the end of 2017 and my most reached for is definitely the Too Faced Sweet Peach Eyeshadow Palette. In my daily routine, I always use the shade 'Peaches n Cream' as the base and the shades 'Bellini', 'Luscious' or 'Candied Peach' all over my lids depending on the clothes and lip colours I am paring with on the day. I also use ColourPop Super Shock Shadow in the shades 'Posey' or 'Tea Party' on days that I feel like I need some sparkles. As for brows, at the moment I am obsessed with the ColourPop Precision Brow Pencil, I love that although it has a creamy texture, it doesn't break easily, it glides on precisely, smoothly and it stays on all day. I have also been using the Benefit Goof Proof Brow Pencil, but I seem to always have this love hate thing with it. I love its slanted shaped pencil as I can draw on the most perfect brows without even trying, but I dislike that it's a little bit too waxy and sometimes it doesn't fill in the brows evenly which really frustrates me when I am running late. Wearing a lip gloss in New Zealand depends on the weather nor the season, and the weather could change from good to bad several times in one day, so the chances of wearing a lip gloss is not that often, but I keep buying anyway, because I love lip products. I have been switching between the Guerlain Gloss d'Enfer Maxi Shine Lipgloss and the Too Faced Lip Injection during the summer, Guerlain Maxi Shine Gloss is another one of my favourites, I have the shade in #901 L'Oiseau de Feu and it used to be a clear gloss with golden sparkles, but as you can see, I have been wearing it with other lip colours that it has now turned into a pinky shade. Guerlain KissKiss Roselip in Pink Me Up is a newly purchased item that I have been reaching for a lot lately, I like that it gives a sheer wash of colour, but I dislike that I have to re-apply every hour. It's pretty much a tinted lip balm, but it's not as good as the Innisfree Glow Tint. The old name for Innisfree Glow Tint is called Innisfree Eco Flower Tint Balm, I have all five shades from the range, but the shade that I love the most and have almost emptied is 'Camellia'. This is also a tinted lip balm, but it's 100 x better than the Guerlain KissKiss Roselip. It's a lot more pigmented, the colours doesn't fade throughout meals and there's no need to re-apply hourly as the colour stays on for forevers. MAC Hug Me Lipstick came as part of the MAC Look In A Box Natural Flare Collection in 2017, the lipstick is part of the permanent range, so it can be purchased individually. I have been reaching for this a lot through the summer, it's a stable in my purse, hence why it looks so wobbly right now as it has melted and fixed in the fridge too many times. I get compliments every time I wear this and that is probably why I am currently obsessed with it. 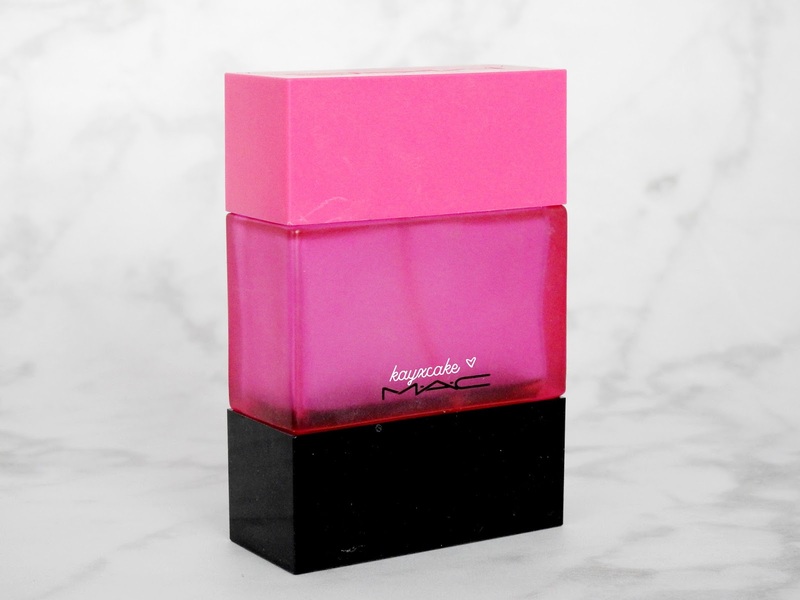 Lastly, I have been using MAC Shadescents in Candy Yum Yum almost every day during the summer, while it is described as a flirty scent, the bottle is bright and girly and the overall scent and packaging screams summer, my main purpose is to empty this bottle so that I can buy a new perfume that I have been eyeing up for ages. MAC Shadescents aren't bad but I am just not really feeling it. I mean, what you say is fundamental and all. But imagine if you added some great visuals or videos to give your posts more, "pop"! I do have a YouTube where I share mostly lip swatches if I was posting up a lip swatch post on the blog. I have thought about your suggestion but my decision is to keep it to a blog as in just writing for now, after all I started this as a hobby, where I will write when I have the free time and if I started doing videos and writing a blog at the same time, then it's too stressful haha, if I was doing that it's more like a full time job than a hobby. Hi :) thanks for your compliment! 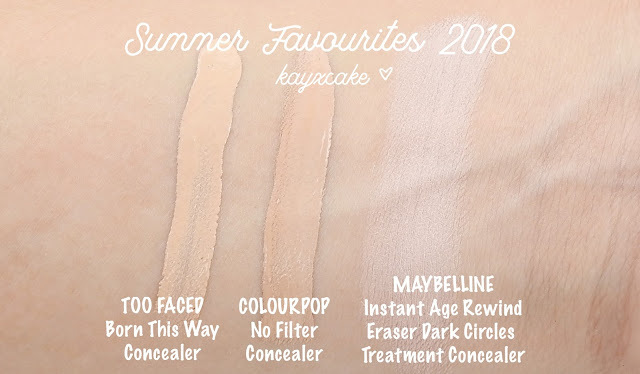 What shades are the colourpop and too faced concealers? Hi Julia, ColourPop is the shade Light 14 (used to be light neutral 15) and the Too Faced one is light.